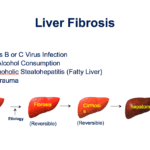 BioFibroScore® is a research tool which has been shown accurate for staging liver fibrosis caused by HCV infection. The assay is also potentially applicable for additional forms of liver fibrosis caused by various diseases including HBV infection, fatty liver, and Nonalcoholic Steatohepatitis (NASH). In practice, additional applications for BioFibroScore® include monitoring liver fibrosis progressing and treatment decision. BioFibroScore® assesses liver fibrosis state by quantifying 3 biomarkers urokinase-type plasminogen activator (UPA), matrix metalopeptidase 9 (MMP-9), and beta-2 microglobulin (B2M) in the blood. Through a statistical algorithm based on the concentration of the 3 biomarkers, the assay could accurately determine liver fibrosis stages that are equivalent to the METAVIR score. BioFibroScore® has been evaluated in 635 HCV-infected patients in comparison to percutaneous liver biopsy and FibroScan®. The assay was shown accurate to assess the stage of hepatic fibrosis. Applying this noninvasive test can substantially reduce the need for invasive liver biopsy. BioFibroScore® consists of 3 quantitative ELISA detecting serum level of UPA, MMP-9, and B-2-M, respectively. Each assay incorporates a set of quantitative standards to allow accurate determination of the biomarker concentrations which are combined and analyzed with a statistical algorithm to assess the stage of liver fibrosis. Patient Preparation – There is no specific requirement to the patients prior to blood drawn using standard venipuncture technique. Specimen Preparation – Collect blood in SST tube. Serum should be separated from the red blood cells as soon as practical.